Ever since 1911 when New Zealander W.Johnson became the first Kiwi to compete in the Isle of Man T.T. races, there has been a continual stream of Antipodeans willing to pit their racing skills against the T.T.Mountain Course. Nigel Bish who originally lived in Hamilton, Waikato District, North Island, made the long journey to the Isle of Man. I caught up with Nigel in the 'Albert Hotel' in Port St Mary, and over several pints of lager, asked him about his racing career, and how he had ended up being based in a garage in Port St. Mary for TT2000. Racing was obviously in Nigel's blood as his father Mike had been a top-level rally driver at Club level in the 1980's. At the age of 11 Nigel was riding a Suzuki RM80, but to curb his enthusiasm for speed, the bike was put into 1st gear, and then the gear lever was taken off. While at work aged 17, a work mate would let him ride his Yamaha FZ600, and he would be sent out on messages, all good experience for the future. Nigel's first road bike was a Suzuki RG250 which was used for everything, including racing, where he usually finished midfield, but eventually he finished up in the back of the ambulance at Taupo. By the time he was 18, Nigel had graduated to a Honda NSR250, and he was starting to win races, but unfortunately he then lost his road licence for speeding. The NSR was proving very unreliable, but working in a bike shop he was able to acquire the expertise to repair it. A 19 year old Nigel then bought a Kawasaki ZXR400 which had been a write off, by scrounging bits he rebuilt it, but because of the engine set up, he never really felt at home on it. During this period Nigel had rather a lot of crashes, and tended to either win, or crash, which often resulted in him ending up in hospital. It was during this stage of his racing career that Nigel acquired the nickname of Bish Bash. By 1994 he was riding a Suzuki RGV250, and was the fastest clubman, unfortunately he was living up to his nickname, and crashed the Suzuki in a big way. As the bike was his girl friends, not only was the bike broken, but his relationship with the young lady was as well. He was then sponsored by Robbie Dean on a evil handling Suzuki GSXR 1100K, this machine taught him a lot, and Nigel feels that he could ride anything after the big Suzuki. Later on in 1995 he got talking to Rob Holden who told him about the Isle of Man T.T. races, this gave him his first thoughts on racing in the T.T. In 1996 Nigel bought a Kawasaki ZXR 400SP, and using second-hand parts modified it, and he even made his own fairing. By the 1996/97 season he ended up the Formula 3 (equivalent of 400cc Supersport) National Champion on Street Racing, he found the bike good in the wet, but a little underpowered. In the Battle of the Streets he managed to finish 5th on the 400cc. The 1998 season found Nigel racing a CBR600 for Honda New Zealand, although he was lying 2nd in the championship for most of the season, he eventually ended up in 5th position. During the 1998/99 season Nigel also received sponsorship from Pirelli, for 1999 he was riding a Honda Fireblade, but due to a combination of machinery problems, injury, and a lack of money, it turned out to be a disappointing season. By now slightly disillusioned (poor prize money) with the racing scene in New Zealand, and for personal reasons, Nigel decided it was time to move on. At the end of 1999 he moved to Australia, and was soon working for the big motorcycle dealers Action Motor Cycles in Sydney. Here he was employed as Business Manager looking after the finance and insurance. By now Nigel had decided to stop racing for the year, and to save up enough money so that he could make the pilgrimage to the Isle of Man for T.T.2000. But how do you go about organising a trip to race in a small island on the other side of the world? First of all he contacted an ex-TT competitor from New Zealand by the name of Jeff Lattimer who told Nigel what he would need to do as far as getting an F.I.M. licence, and how to go about organising entries for the T.T. The next hurdle was to get insurance, and a letter of release from Motorcycling Australia to enable him to compete internationally. After this Nigel then contacted Motorcycling N.Z, and got them to send a reference regarding his achievements in the sport in New Zealand, including his involvement in their coaching programs as an instructor. This was mainly to let the ACU know that he was up to the challenge of the TT. As for getting in touch with the ACU, Nigel got on his computer, and by surfing the web pages, he found a list of handy contacts on the internet. While he was on this site, he left messages on the TT Bulletin Board asking for advice, and any help that people could offer him. Nigel received lots of advice, and I was able to offer him the loan of my son in law's ('Daz' Blake) garage in Port St Mary. I also advised him to contact the IOM Steam Packet as soon as possible, and book a ferry crossing for the TT fortnight. Through the Bulletin Board, Nigel was able to get in touch with Alan 'Grandad' Warner who put him in contact with Bill Smith in Chester to organise some race machinery. On contacting Bill, he agreed that a 125 and 400 would be good bikes for Nigel's first attempt at the TT. Bill could lease a Honda RVF 400 for £800 (2,000Aus Dollars), it would be a standard RVF, which are reliable safe handling bikes, and well suited to the bumps of the TT course. Other people had told Nigel to ride a 600, as 400's were impossible for Newcomers to qualify, but in the end Nigel chose to go for the 400, because of his experience on these bikes in New Zealand. Unfortunately he was unable to lease a 125, so he started searching for a bike in Australia, eventually he tracked down a tidy little 1996 Honda RS125, it was standard, but had a new crank, and lots of spares. After giving the little Honda a 20 lap test run at Eastern Creek Circuit (Sydney), Nigel decided to purchase it. The next major problem was how to get the 125 to the Isle of Man in time for the TT. Fortunately Nigel had managed to obtain some sponsorship from Garuda International Airlines in the form of a 100kg-baggage allowance, so he proceeded to strip the Honda RS125, and pack it into suitcases for the long trip to the U.K. The fairing proved too big to pack away, so a new one was ordered from ARD in the U.K. The rest of the machine was sent to New Zealand, and was to be carried in the baggage of his mechanics. Nigel's mechanics and helpers for the T.T. were Shane Gill, and Mathew 'Fred' Peters both from New Zealand. They had both crewed for Nigel while he was racing for Honda New Zealand, and were long term friends. Gavin Taylor, a workmate of Nigel's in Australia was also going to make the trip to the U.K. Gavin who was originally from Leeds, would prove a great help when the team finally arrived in the U.K.
At the airport the look on the face of the customs official was priceless as the suitcase containing the 125 engine went through the X-ray scanner, and there were a few nervous glances at the overhead lockers every time the plane hit some turbulence. So after months of planning the 'team' finally arrived in the Isle of Man. The first thing the team wanted to do was to have a drive around the TT Course; they could not believe the size, and complexity, of it. By now Nigel was beginning to doubt his sanity, and became more than a little nervous, and he knew that Bray Hill was going to be terrifying, but on the other hand he was quite looking forward to the beautiful Mountain Section. John from Breadline Racing had put Nigel in touch with Mannin Collections Racing, who are based in the Isle of Man, so Nigel and the team shot around, and met Alan, and the boys. They were very helpful with their advice on set up, and offered to lend them anything they needed for the race fortnight. Nigel was very impressed with the professionalism of the Mannin Team, and was honoured to be 'taken under their wing'. 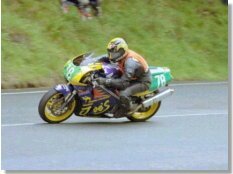 Nigel had entered the Lightweight 400cc TT on the Honda RVF400 and the Ultra-Lightweight TT on the Honda RS125, having had his entries accepted for both events, he now had to qualify during the practice periods. For the first practice session it had been decided to use the 400 bike. It was a rather nervous Nigel who set off on his first ever practice lap, but all went well until Ballaugh Bridge, when rather under estimating the severity of the hump on the bridge, the story nearly ended there. Nigel is still not sure how he stayed on the 400, but he got very close to some of the buildings, and nearly needed to stop for a change of shorts. After that scare Nigel decided to ease off for the rest of the lap. The first lap on the 125 was exciting as the light little machine bucked, and slapped its way around the course. Nigel found the little bike to be amazingly twitchy, and he even thought about stopping at the Quarter Bridge to check if the wheels were done up. For the next practice session the team decided to see how far the RVF would go on a brimming tank of fuel.. 2 laps and 13 miles it turned out! Nigel met some nice marshals, one of whom was gracious enough to give him his last beer, which was fortunate as it was dark before the lads arrived to pick him up after trying a 'shortcut' in the van. The next mornings practice session found Nigel coasting to a stop with an empty tank, at the Black Hut on the second lap, after his crew had decided to fill the tank to 'about that'. This time Nigel got to lay back on a bench in the morning sun, whilst drinking coffee, and eating all their biscuits, at this rate he realised he was never going to qualify, but at least he was meeting some extremely hospitable people! On the next morning of practice Nigel ran wide at Whitegates, mounted the footpath, and opened up about six straw bales. He managed to stay on, but broke the gear lever off, so had no option but to stop. While he was standing with yet another group of marshals, and drinking their coffee, he had time to reflect on this sobering incident, and decided it was the best warning he could have as to how unforgiving the T.T. course could be. This led Nigel to take a more steady approach in the remaining sessions, and hopefully no more Bish-Bash. That afternoon on the 125 he qualified nicely inside the cut off time, at last the circuit was beginning to come together. In the Wednesday evening practice, which was run in atrocious conditions, Nigel with his wet weather skills, and his new smother approach to the course, finished the session in 3rd place on the 400 leader board. This left the team in good spirits for next week's races, and as the weather closed in for the rest of the week, it was time to relax! Nigel's dad Mike made an unexpected trip to the Island to lend a hand and to make sure that no one got arrested! Nigel's mum had given him instructions to make sure that Nigel got home in one piece. Fellow Kiwi racer Johnnie Hepburn found time to take Nigel around the course in his van, and gave him the benefit of his considerable TT experience. With the advice he got from Johnnie he was able to take safe, but fast lines in all the sections he was previously wary of. By now some of Nigel's favourite sections were Glen Helen, and Sulby, but the best part of the circuit was the Mountain, as he felt once you got to Ramsey Hairpin, you were 'home and hosed', and he felt more relaxed and could really begin to enjoy the ride. Monday 10-45am was the scheduled start time for the combined Lightweight 400cc and 250cc T.T. Nigel's start number was 78, but after numerous delays because of mist on the Mountain, the race finally got under way at 3-15pm, and was to be reduced from 4 to 3 laps. Nigel takes up the story " The delays were an absolute nightmare for a first-timer, sitting around the mind was really starting to work overtime, and I just wanted to get it over with before I talked myself out of the race. The pit stop went ok, but I didn't get a drink though, which was a bummer as I had been thinking about it for half the previous lap, by the time I got to the finish line I could hardly talk I was so parched! I had a scary moment on the last lap when I went into Milntown a little hot, and almost bounced of the left-hand kerb. The hardest thing about this circuit is you often don't know you are on a bad line until it is too late to do anything about it. The bike ran really well though, and despite having worn tyres, and no steering damper I hardly had any real big tank slappers. I arrived at the Gooseneck to a standing ovation which I thought was a little strange, until Joey Dunlop passed me on the way out on his 250, he was so sure and smooth that I was mesmerised until he went out of sight. He is surely going to be missed at the T.T. I can't believe the guy who won was running a 600-I mean what was he thinking, surely the top three bikes always get stripped? (The provisional winner who was running a 600 engine was later excluded from the results) I now wonder though if he was the only one running an oversize engine as I had another FZR pass me like it was a 750 down towards the Creg. Although I could get back onto him through the corners, I had no match for the sheer speed of the thing. But I was more than happy with twelfth place and fastest newcomer." Wednesday was Nigel's next race, the Ultra-lightweight 125 T.T. Nigel continues "I really felt as though I was beginning to come to grips with the course by now and was getting quicker every lap. I was enjoying every minute and getting more and more relaxed, enabling me to think my around which made me feel a lot safer. The pits incident? That screwed my head up a little. What can I say? - I know the onus is on the incoming rider, but I was already past this guy when he hit me behind my right leg. I kept moving forwards to enable him to get past, but it seemed to take an age and by the time we were untangled I was miles past my pit. He retired at Quarterbridge and I hope it was not due to our 'coming together'. My crew made up for it with a lightning pitstop and I was back on my way to another 100mph lap (95 was my goal). I was pulling wheelies and generally clowning around on the last lap, there were a few places where I would give a wave to the crowd and their response was amazing - it really gives you a buzz. I'm sure there is no other road race in the world with that kind of atmosphere. By the end of the lap I was kind of sad, realising that I wouldn't be going again, though the relief when I crossed the line was huge. Touring back to the pits you feel like a star with everyone clapping and patting you on the back - an indescribable feeling." Nigel finished in 17th position, and won the Newcomers award. When one considers that the factory race grand prix teams require a fleet of 40-ft wagons to compete in a race, all Nigel required for his 125 was a fleet of suitcases! Nigel was most impressed with the prize giving ceremony and was full of praise for the organisers. He collected 2 bronze replicas and 2 Newcomers medals, and it transpires he will also receive the Newcomers Trophy, which is awarded to the solo competitor with the best performance calculated as a % of the winning time. He had no complaints about the start or prize money; it would have been impossible to finance his trip from the other side of the world on his wages alone. When asked about the safety aspect of the course, he would like to somehow have more practice time available, "so there would be less pressure on riders to try and qualify early in the week. This would enable people to re-acquaint themselves with the circuit before pushing hard. Physically it will never be a safe place, rather it is up to the riders to treat it with respect and ride within their limits." Did Nigel find the TT course as dangerous as he had been warned about? Some aspects were certainly frightening, but the overall impression he got was that it was only as dangerous as you make it. When I asked Nigel what advice would he give to potential Overseas Newcomers, he recommended they get on the TT Website Bulletin board, and ask for help as soon as you start thinking about doing the TT, as there is a wealth of knowledge out there. He also suggests you contact your local Motor-cycling Governing body, and ask them to run an article in their newsletter asking for more riders who are interested in going to the Isle of Man. If a bunch of people get together it will be cheaper, and easier to organise. When asked if he will be back next year, his answer was. Anyone need a rider for 2001?????. Nigel would like to especially thank the following people for making his trip possible. Caroline- for letting the 'team' sleep on the floor, and doing the washing! Mannin Collections Racing-all the guys they're for taking time to help us. ACU and IOM Tourism and Leisure Dept.-for running an amazing event. And everyone else who lent a hand, thank you, and hope to see you in June!